Yesterday you searched for Planters nuts on Amazon. Today, there he is, Mr. Peanut—monocle, top hat and all—smack in the middle. In the Facebook iOS or Android app, tap the three lines in the bottom-right corner, select Settings > Account Settings > Ads. Tap “Can you see online interest-based ads from Facebook?” and then “Off.” This will turn off the setting across your Facebook account—on all your devices. On a computer? Go to facebook.com/ads/settings. On your computer, if you want to stop other sites from accessing your browsing history to feed you ads, head to the Digital Advertising Alliance Consumer Choice page . This will only work, however, on the computer you are on. Also, if you clear the browser cache in the future, you will have to redo the process. You should enable “Do not track” in your computer and smartphone’s browser. In Chrome, click the three vertical dots > Settings > “Show advanced settings…” > Privacy > “Send a ‘Do Not Track’ request with your browsing traffic.” You can find similar settings in Safari, Firefox, Edge and Internet Explorer. On an Android phone, go to Settings > Google > Ads. There you can click “Opt out of interest-based ads.” This setting is just for Google-based ads, however. These settings won’t end the ads, but they can limit how often Mr. Peanut feels the urge to sneak up on you. 5 Social Media Marketing Strategies that all eCommerce Marketers Must Know! With more customers shopping online than ever before, and ever-increasing competition for attention, online businesses will only be able to maximize their success if they learn how to build on organic engagement in social media. Don’t get me wrong, gaining organic traffic through search, and even conversions from paid ads, are still great ways to build business. However, leveraging a community to build sales from organic engagement costs nothing more than your time. And besides that, there are plenty of tools available to help you along the way. Here are five practical strategies you can implement straight away which will help boost traffic and sales through your social channels. If all you do through your social channels is promote your own products, your audience is going to burn out on your pages and posts pretty fast. The more the engagement drops on your posts, the less often your new posts will be seen by your followers - after all, channels like Facebook, Twitter, and Pinterest want to display only the most interesting content to keep users engaged (and there are a lot of brands competing for the limited space in a user’s social feed). Ramp up engagement by finding really awesome repurposed content. I’m not just talking about reposting old articles or sharing cool stuff you found on other websites. Instead, take the Skyscraper approach or create something similar to Buzzfeed’s listicles. Find an interesting topic and mold it into something much better than the original. That’s what the guys at Shopify did when they were tasked with launching a profitable business in just three days. Using BuzzSumo, they searched for pieces of highly-shared content that was relevant to their audience. Using the original video created by someone else, they took the tips and created a targeted list post, then shared that to a relevant community online. It didn’t take long for the new content to start driving traffic to the online store where the article was hosted. While this surge of new traffic usually won’t result in immediate sales, well-optimized content like this will continuously send traffic and generate sales over the long-run. One of the problems faced by many marketers today - not just those in ecommerce - is that the web is in a constant state of information overload. Audiences are bombarded with updates from their favorite brands, publishers, and media outlets, both directly and through the shares from people in their network. With limited time and shrinking patience, consumers just aren’t willing to spend a lot of time digesting content anymore, you can’t expect them to be willing to watch a 10-minute video or read a 5,000 word article when they’re on-the-go. This is why micro-content comes in handy. Short, 10-second Snapchats or brief videos posted to Instagram and Facebook – or even a video converted to GIF format for Twitter – can bump up your engagement. With micro-content, you get the same benefits of video, and your audience is more likely to watch when they know it won’t cost them more than 10-20 seconds of their time. Major brands have been leveraging this since Vine took off, including Lowe's, Doritos, Taco Bell, and even NASCAR. It’s not uncommon for marketers and online store owners to have tunnel vision and get stuck on the idea that social media is all about Facebook, Twitter, Instagram, Pinterest, and Snapchat. But blogs are absolutely forms of social media - they’re platforms where content is posted, and that content sees shares and comments, just like the more popular social platforms. When you’re marketing an ecommerce business, be sure to include regular blog outreach in your social media strategy. It can drive a LOT of traffic back to your store if you do it right. That’s what Richard Lazazzera from A Better Lemonade Stand learned when he challenged himself to launch a t-shirt business in just 24 hours. After creating his store on Shopify and listing his products, he reached out to a local blogger to ask if he would be interested in covering the products since they related to an article the blogger had recently published. When Richard woke up the next morning, he found a stream of notifications from new customers that came from that blogger publishing a post about the shirts. That post not only led to sales, but other people interested in collaborating with Richard. Don’t just create your own content, reach out to influencers and bloggers who align with your audience and work with them to get your business or products featured on other sites and social channels. Whenever you post content on your social channels, it should have a purpose, whether that’s to generate comments, shares, drive traffic to your store, etc. The best way to do that is to always create content with a focus on maximizing engagement. Some of the best ways to do this include: asking questions, crafting strong call-to-action specific to engagement, and targeting your audience’s emotions with a little controversy from time to time. This is particularly effective if you center your content around a product or your brand, like Ahole Gear has done. Doritos recently combined another one of the above approaches by creating a short video clip that leverages their product and adds a touch of political controversy to get people talking. The more engaging your content is, the farther it will reach beyond your immediate followers as they comment, like, and share the content. This will lead to repeat customers as well as the acquisition of new customers who weren’t previously aware of your brand. Customer product reviews are a great ways to build social proof on your product pages and let new customers know what they can expect when making a purchase from you. A lot of ecommerce platforms use apps like Yotpo to develop more engaging reviews in their online stores, but you can also leverage reviews from your social media. Not only does Yotpo enable you to connect your social accounts to post user-generated content on your pages, but Facebook also has its own native reviews that you should activate. This way, when prospective customers discover you in social media they can see right from the channel, without ever going to your site, that people are raving about your products and service. For example, Coval Vapes is a brick and mortar store that also sells its products worldwide on its online store, and it has amassed a nice run of highly-rated reviews on its Facebook page. Be sure to consistently encourage your fans to leave reviews. Rather than ask for reviews through your social channels, send follow-up emails after purchases and include a highly visible call-to-action note. Ask them to please come back and review their purchase on your social channels, or within your store, so you can later benefit from greater social proof generated by satisfied customers. Content is king. As a marketer and business owner, I hear this almost every single day - and I’m sure you do too. Truth be told, it’s the context of the content that's really important. You need to find and share content that will either entertain, inspire, educate or convince your audience with each piece you put out. That being said, it can often be difficult to discover and curate a steady stream of shareable articles, videos and infographics. The web is a big place, and knowing where to start searching is often half the battle. Below I’ve listed 9 awesome apps, tools, and websites which can help you discover new content. Each of the platforms should offer itself as a starting point from which you can build your social media calendar. Nuzzel is one of the best apps for finding content - particularly if you’re active on Twitter. If you follow numerous accounts that are relevant in your industry, the content provided by Nuzzel is invaluable. The app connects with your Twitter feed, and shows you the most shared content from users you follow. If you don’t follow accounts relevant to your industry, don’t worry - Nuzzel also lets you see the most shared content from the followers of other users. So for example, if you wanted to see what real estate news is trending, you could go and look at a real estate influencers' feed on the app. It’s a great way to stay on top of the latest news. StumbleUpon is a discovery engine that finds and recommends content to users. All you have to do is select a few interests, and hit the 'Stumble' button and the platform will show you pages relevant to your interests. StumbleUpon is great at finding unique, share-worthy content. If you’re looking for a way to spice up your content curation, it can be very helpful. Reddit is the front page of the Internet, and it’s a great place to find content. Subreddits enable users to browse different topics - everything from DIY to World News has a subreddit where users post and upvote the best content. Take a look at the subreddits and subscribe to those that are the hottest in your industry. This way, when you log into Reddit, your front page will be full of content specific to you. Tip: Reddit can also be a great place to share your own unique content. If you’re active on the platform and get familiar with some of the subreddits, submitting tasteful (not spammy) links can be a great way to get more traffic to your website. A news aggregator, Digg focuses on articles that are getting the most shares around the web. The platform is particularly good for finding technology, science, and entertainment news, and even enables you to get notifications as to what's being shared the most in your social networks with Digg Deeper notifications. If you’re looking for the most popular content to show up in your inbox, Digg is a great platform to use. Feedly is one of the most powerful tools on this list, enabling users to subscribe to multiple news feeds and create custom segments that they can follow. Feedly makes it easy to keep track of different types of news, and even to monitor popular news stories based on topics. Desktop, iOS, and Android apps are all available with Feedly, and with a plethora of integrations -like Pocket and Buffer - Feedly truly can be your central hub for content curation. Buffer launched the Daily app as a way for users to find more shareable content, and it works very well. The app shows users popular articles in one of 6 categories: 'Marketing', 'Inspiration', 'Business & Startups', 'Lifehacking', 'Design', and 'Buffer Picks'. Then, the app cycles through articles and headlines in a Tinder-style dance, making scheduling content super easy. Aiming to be the #1 question and answer site online, Quora enables its users to ask and answer questions. The community is growing, and it can be a great place to find unique content. Questions come in all shapes and sizes, and cover virtually every topic imaginable. If you have a certain phrase, company, or anything else you’d like to monitor in Google search results, setting up Google Alerts is a great option. Google Alerts will notify you daily of any new search results including your keyword, and send the info straight to your inbox. It’s a great way to monitor articles mentioning both you and your company. Formerly known as Read It Later, Pocket can be a life saving tool when it comes to curating content - it may, in fact, be the most important tool on this list. After you’ve tried out each of the above platforms, one of the most challenging tasks is organizing your content. This is where we highly recommend using Pocket, as part of the three-step content plan. Save everything to Pocket, and use the app's 'Recommendations' feature to find more content that you can share with your audience. Think of this app as your ever-present content bank. Getting more in-store sales with Facebook & Instagram ads! People come to Facebook every day to connect and share experiences with friends and family. We share the great places we go and we ask our friends for advice when we need help getting things done. Today we’re starting to introduce a variety of new features that help you use those connections to discover new things in the world around you, decide what to do or where to go, and connect with local businesses in easier and faster ways. Whether traveling to a new place, looking for a hair salon, or searching for the perfect place to eat, people already turn to their friends, family, and local Groups on Facebook for advice. We’re rolling out a new tool that makes it easier to get and organize all those recommendations in one place. When you write a Facebook post looking for advice on local places or services, you’ll have the option to turn on Recommendations for that post. If you turn on the feature, your friends can comment on your post with suggestions, and you’ll see all of them mapped out and saved in one place. You can also go to your Recommendations bookmark on Facebookto ask a new question or help your friends. Facebook is a great way to find events happening around you and now it’s even easier to discover new things to do with friends. To make exploring events even better, we’ve revamped the Events bookmark on Facebook. You can catch up on the latest events activity from friends and hosts and browse event recommendations based on what’s popular with friends or events you’ve connected with in the past. This new version of the events dashboard will start to roll out in the US in the coming weeks. We’re introducing some new ways for people to take action faster once they’ve found something they want to do or a place they want to go. We’re starting to roll out these initial experiences in the US today. This is the first step, and over the coming months we’ll be launching even more new features that will make it easier to get things done, make confident decisions and communicate directly with businesses on your time and terms. Pinterest is gaining active users. Last September, Pinterest reported that it had reached the milestone of 100 million monthly active users. And while, comparatively, that may not seem like much – Facebook has 1.71 billion MAU – as highlighted by Pew Research, Pinterest usage is actually increasing at a significantly higher rate than most other platforms. While the bigger platforms get more hype, Pinterest has slowly, but surely, been establishing their place in the social sphere, with ambitions to be generating $2.8 billion in annual revenue by 2018. 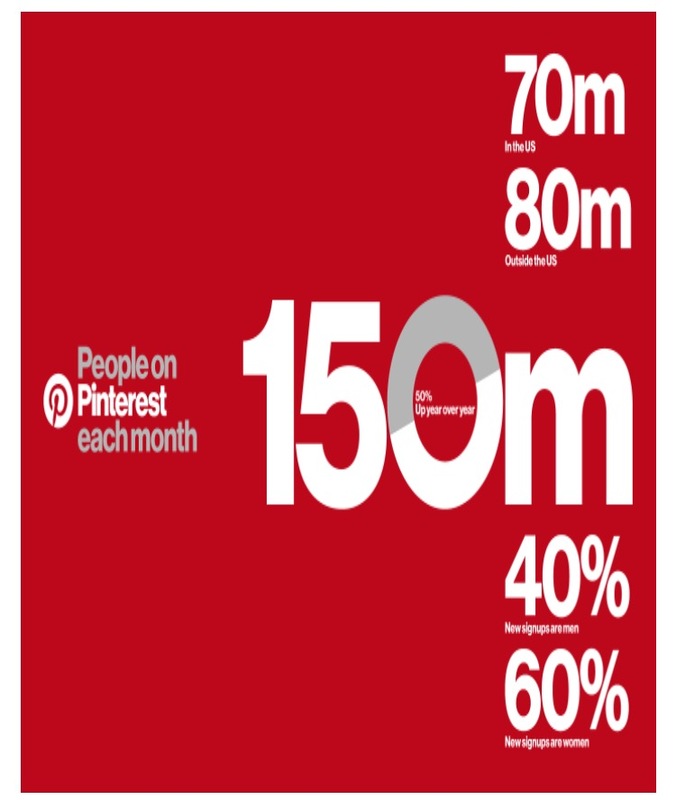 And today, Pinterest has reported its latest growth achievement, reaching 150 million active Pinners – a 50% expansion in audience from 12 months ago. At the same time, part of the platform’s evolution has also seen Pinterest moving away from being a ‘social’ network and more towards an eCommerce solution. That’s not a bad thing, but the focus of the platform is, over time, drifting further away from the social element and more towards facilitating consumer interaction with brands. That shift is also evident in the numbers – 75% of all saved Pins now come from business boards. The change in focus has also been underlined by Pinterest’s management – CEO Ben Silbermann describes the network as a place where people go "to find ideas" as opposed to seeing what your friends are doing, while the company’s broader ambition is to create a platform “with the scale and engagement of Facebook and the purchasing intent of Google”. It’s clear that Pinterest sees itself as something other than a social network, but then again, that framing may also have something to do with market positioning. Pinterest, eventually, is expected to go public, and doing so as a social network will inevitably see them compared with Facebook, something that other social networks - Twitter most notably - have struggled with. But changing their definition could help avoid such comparison – Snapchat has recently taken a similar tack, with Snap Inc. listing itself as “a camera company” not a social networking app. Among other details released by Pinterest, the platform says it now serves 10 billion recommendations per day to users - the equivalent of 3 trillion a year - while more than 150 million visual searches are conducted monthly. Pinterest also says there are now more than a million businesses active on the network, with “tens of thousands” now utilizing their paid ad options. It’s a good report card from the Pin network – if your brand has never considered Pinterest, particularly if you’re a B2C, the platform is definitely worth further investigation. A hundred and fifty million people, innovative search and discovery options and improved advertising tools. There’s a lot to like about the growing world of Pins. Want Social Media Today updates in your inbox? Sign up to get the daily email newsletter read by 97,500 social media pros. Although social media is ever changing I feel there are 10 core principals to keep in mind. I have a mantra when it comes to marketing: Brands don't influence people, people do. In today's complicated media mix, it's imperative we embrace the art of messaging as a form of popular psychology, not as a fusion of "industry standard" tactics. That's not to say it's not our job to sell stuff. It is. Rather, progressive marketing acknowledges the wildly advanced state of mind today's consumer possesses and, furthermore, pays respect to it. The sophistication of the millennial generation—the largest and most diverse ever—is something few agencies, and even fewer brands, want to acknowledge. Not only are we not smarter than them, we're falling into rhetorical pits that they've dug for us. The biggest example of this is what we can call the "authenticity" trap. Simply put, authenticity means little to millennials. They use the word in focus groups because they've learned it's what millennials want to hear. Influencers use it in pitches because they know it's what will garner big brand checks. Media picks up on it as a cure-all because it generates traffic and offers simple solutions to complex problems. There are a few issues at hand here: Semantics, Messaging and Targeting. All are opportunities to plummet into the authenticity trap. Smart brand marketers will navigate around them and reap the rewards. Take a look at what authenticity actually means. Synonyms from The Merriam-Webster Thesaurus include "validity," "genuineness" and "dependability." But this definition presents a double-edged sword for Madison Avenue. There's nothing valid, genuine or dependable about selling things to people. There's no such thing as the world's most valid automobile, genuine pair of sneakers or dependable bottle of vodka. Every product or service has an interesting story to tell, but few are authentic. And that's 100% OK. Think about those words again -- valid, genuine, dependable. They're not exciting, and excitement is what moves products and builds brands. Would you rather have dinner with the most dependable man in the world or the most interesting man in the world? An enticing personality matters more than a brand's bona fides. The way for brands to build loyalty in the 21st century is to behave more like people. Elements of humanity are more important to emphasize than blanket declarations of authenticity. Examples of this abound in popular culture. Vice has built a powerful brand rooted in counter-culture and anti-establishment mentalities despite quite literally "selling out" to conservative entities -- first in 2013 when it sold a stake to Rupert Murdoch's 21st Century Fox, then again in 2014 when it sold a stake to Disney and Hearst's A&E Networks. It even shut down an iconic Brooklyn music venue in order to gulp up more real estate. Kanye West is not authentic, yet he's the most influential celebrity alive. He preaches accessibility in fashion, then turns around to create hyper-limited, $200 to $525 runs of sneakers, or charges $55 for $4 Gildan tees in his promotional pop-ups. Vice and Kanye are hypocrites. But aren't we all? It's what makes us human. They may not be authentic, but the way they talk to people is. This is why they're winning millennial hearts and minds. Herein lies the underlying disease that the rush to authenticity is merely a symptom: millennial as target. It is proof that people making decisions at many major corporations have little respect for consumers, but a great desire to drain their pockets. Through some nebulous form of groupthink, we discovered that millennials value "authentic" experiences. So let's not look any further. Authenticity. It seems new. Down-to-earth. Organic. It's a word that glides through marketing documents. Maybe even secures promotions. It can get press. It's a clear and simple talking point. Through the lazy embrace of authenticity as a key selling point, brands lose energy that could be used to craft a nuanced persona. By being "about" authenticity, a brand ironically loses most of its temperament. It's not very authentic to spend huge budgets talking about how authentic your brand is. Furthermore, some of the most authentic people in the world are also the most self-absorbed. The word today is most used in the mainstream media as a descriptor for presidential candidate Donald Trump. Trump is authentic. He seems genuine to a large portion of the American electorate. Yet very few brands would seek to emulate his personality. His poll numbers are historically low among millennials. So much so, in fact, that the attempt to make a #millennialsfortrump hashtag had predictably disastrous results. On the flip side, some of the least authentic brands are the most popular with younger consumers. They've not only created clear, powerful brand personalities, they've paid respect to their targets by segmenting them by lifestyle, interest and consumption habits—not just generational stereotypes. Remember that famous line from Shakespeare (not a particularly authentic playwright in his own regard), "What is the city but the people?" Brands should stop focusing on cold, tactical, self-promotional messaging geared toward garnering points on the ephemeral authenticity scale. Instead, they should rally around personalities. Focus on creating an interesting story and a unique aesthetic. Plug in some unexpected people to help weave that narrative. See what happens. It might not be authentic, but it might actually work. The Ultimate Social Media Graphics Cheat Sheet! If you're looking for a detailed guide to social media photo sizes -- including recommended dimensions, minimum and maximum dimensions, image scale, and more -- then this is it. Another marketing solution by Shop Local Media. It’s hard to imagine that there are still businesses out there that don’t appreciate the power that digital marketing and social media offers. It’s actually pretty common that a new business wants to get discovered and increase sales, but they don’t want to invest the time or money in a proper social media strategy. And while there are some great benefits to creating a successful social media strategy, not having one can really hurt your business. Here are four reasons why not having a social plan can be a major misstep. What if I told you that our agency routinely sees highly targeted website traffic from Facebook for as little as $.12 per click? The average cost per click on Google Adwords can be between $1-$2, so you would be paying up to 20x more in some cases. The targeting parameters social advertising offers are so detailed that with the right strategy you can get great exposure with even the most niche audiences. If you aren’t employing a social media strategy, you're probably paying way too much for your current digital advertising campaigns. Did you know that the average person checks their phone approximately 150x per day - and checks Facebook roughly 14x per day? Since digital consumers are addicted to being digitally connected, they expect accessibility to the brands they do business with. By not having a social media strategy, these users have much less access to your brand, and are therefore less likely to do business with you. It's estimated that 67% of consumers now turn to social media sites as a way to get customer service. Furthermore, 33% of consumers prefer to use social media rather than the telephone to contact brands for such interactions. With this expectation of access and responsiveness, not having a social media strategy could cost you customers and revenue. I don’t proclaim to be an SEO expert, however there has been a fundamental shift over the last few years when it comes to optimizing a website for search engines. In the past, marketers would spend hours trying to build links and stuff keywords everywhere possible. Now, content is super important when it comes to search rankings. And how do people usually discover and digest blog content? Social media. Distribution of your content through a solid social media strategy helps attract more users to your website, helps generate social signals and demonstrates authority - all of these factors are correlated with better search rankings. Even social media profiles themselves rank in search engines, so if you don’t have profiles established, you're losing real estate for your brand with certain searches. Long story short, not having a social media strategy is a disservice to the search engine optimization of your website. The top inbound marketing tool that can help bolster customer retention is email. A close second is social media. With an effective social media strategy, you can help influence repeat business through high-quality customer service, customer sentiment analysis and social advertising to specific segments of your customer base. You can also position your brand as a go-to resource for you industry with your content strategy. Without a social media strategy, you're likely missing out on some key tactics that can help keep your customers engaged, happy and continuing to do business with you. There you have it - four solid reasons why not having a social media strategy can actually hurt your business. While social media marketing is something that takes a lot of time and practice to do right, social media marketing drives business value. Maeketing Service in Sarasota, Venice, North Port, Port Charlotte, Punta Gorda and Fort Myers Florida. Four years post founding Facebook, Mark Zuckerberg predicted that the content shared on the platform each year would be twice the amount shared the previous year. Two–thirds through 2016, and his proclamation seems to be perfectly on cue. Competing against the ever-expanding number of posts calling for people's attention is no mean task, however seasoned the marketer or large the brand. Simply increasing your activity won't work (as many have already discovered), to truly succeed on social media you've to face and overcome the facts that few people talk about. Here are five social media marketing secrets that every marketer needs to know. As observed by Puranjay Singh, there are several self-proclaimed 'experts' who have made generic suggestions that are founded in the past. Following their advice to increase your number of posts per week or write blog posts more frequently won't always work. Irrespective of how confident or compelling the posts are, there's no proof to the existence of an absolute, conquer–all formula for social media marketing. First off, every company is unique, as are the problems they're trying to solve, and the characteristics of the audience they want to attract. Additionally, social media platforms are constantly evolving, and with them the behavior of audience groups. There's no plausible way for one formula to produce brilliant results for every single business. Imagine you were marketing an IT services based company and a restaurant on social media. Would your approach to both be the same? Study your audience and niche, and formulate the best plan possible for your brand, specifically. To help with this, there's a range of solutions available which every marketer can use to analyze their results improve their performance. Here is a short list of four such tools. Google Analytics is a great way to study and optimize your social media efforts. By determining which platforms drive most of your conversions, you can make an informed choice on where to invest your time and money. Content curation app DrumUp is a quick source for content to fill in your engagement gaps. Its online content reserve option and advanced scheduling (with creation of account groups for multiple account management) are great time-savers. Social monitoring tool Social Mention helps monitor brand mentions, competition and important keywords. Their sentiment analysis option, in particular, is great for brand reputation gauging and management. Image optimization app PicMonkey is the ultimate destination for images. Not only does the app have canvases to choose from for different usage, but there are also pre-made templates with background and font styles for each of them. The target for any marketer, on social media or otherwise, is ROI - unless you can justify your spend, marketing on any platform is pointless. One of the first barriers to this, in social media terms, is building a following. Unlike TV or radio where you advertise based on viewership that already exists, on social media you begin posting content to attract that viewership before you can expect any real results. The hard truth is that, initially, no matter how brilliant the content is, your engagement levels will probably be low. Consistency in content quality and frequency, over time, and when paired with the right strategy, is the path to respectable social ROI. To get past that first barrier of building an engaged following, a content marketing plan is essential. According to this study, 70% of marketers lack a content marketing strategy that's consistent. What are the challenges that keep marketers from succeeding at content? Documenting your strategy is extremely important. As proved by Content Marketing Institute a documented strategygives you more confidence and helps you justify your spend better. Companies have always channeled promotional messages and marketing models through their employees (offline referral based marketing). What most marketers still fail to realize is the tactic works equally well on social media. In fact, considering the virality of social media, referral or employee based marketing could provide even more effective results. Who can generate word of mouth for your brand on social media? Customers, employees, partners and fans. Building relationships with people is a pre-requisite for running any type of business. Extending these relationships to social media has benefits beyond simple measurement. With customers, you could collect and share testimonials or success stories on social media (guide to user generated content). With employees you could create an exciting employee advocacy program around promoting your company content (employee advocacy guide). With partners you could initiate mutually beneficial social media marketing partnerships. With influencers you could request them to help you gain visibility in exchange for a fair payment (influencer marketing guide). Word of mouth is powerful because of the increased visibility and credibility it affords your brand, and cannot be compared to traditional marketing (self-promotion). Also note that people are more enthusiastic when they're involved themselves. Data is the holy grail of marketing for many marketers, but unless you're capable of comprehending that data and drawing actionable insights from it, it'll remain little more than a bunch of numbers. There's only so much that data, itself, can do. For instance, there are algorithms that can read comments, identify positive/negative words and tag them as relevant - but no algorithm can accurately depict how people feel about your brand. Your entire strategy can't rely on data alone. The best approach is to assimilate data, apply other, relevant insights and build the rest of your strategy based on your experience and understanding of your audience. The better you get to know your audience, the more beneficial it'll be for your business - in fact, unless you personally interact with them, you'll find your growth on social media limited. Give social media its due, but see it for what is is - a medium - and focus on connecting with the people on the other side of that medium. That's undoubtedly the best perspective for success on social media.